I am the proud godmother to three amazing little girls. It is an honor to be chosen for this special role. In addition to serving as a role model of faithfulness (eek!?) I also believe that one of my duties as godmother is to role model feminist, inclusive leadership and work-life negotiation strategies. I haven’t yet told the parents of these girls that this is how I see myself as godmother. Hopefully they are okay with this since they chose me! Two of them are my siblings, so I think I am okay. Two of my three goddaughters recently had birthdays and I refused to buy them tiaras. I bought tutus, wands, journals and feather pens, and pretend play shoes and jewelry. But, I drew the line at a tiara. When we were in Toys R Us, my sons kept pointing them out and asked why we couldn’t get them. I fumbled over the answer and tried to explain in terms they would understand what a tiara represents. I did not do so well on the spot. After some reflective time, my answer is this: Tiaras imply weakness. 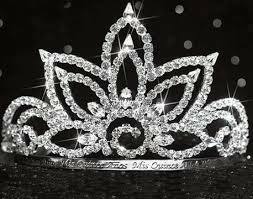 Tiaras imply something that is given to a young girl for superficial reasons- looks, personality, bikinis. Tiaras are usually given to girls by a “higher” power, usually a man, because said higher power has deemed the recipient worthy. I recently had my own tiara-resistance moment. I have applied for a job. It is within my current setting, but with a completely different focus- alumni development. On paper, it is a dream position- develop relationships, network with, and create programs for young alumni. Swoon! I knew that the position was going to post and I thought about just submitting my materials and then waiting. Like I have done with every other job search in my life. In the past, I have absolutely been guilty of the Tiara Syndrome. Carol Frohlinger of Negotiating Women, Inc. says that TS involves keeping your head down, doing good work, and waiting for people to notice and reward you. Instead of waiting to be noticed, I emailed the person who would be my supervisor if I got offered the position and I asked him to coffee. I was bold. I was direct. I did not wait, I advocated for myself. I said, “I would like to learn more about your office and what you do. Can I take you to coffee?” I have never done this before in my entire life. I was absolutely terrified. Was I too bold? Was I pushy? Would it be awkward if he said no? He said yes. We went to coffee and I learned a TON about the office, his style, the position, and what he is looking for. I told him that I would be applying and then indicated why I would be a strong candidate. Again, I have never done this before in my life. Guess what? It didn’t hurt. It was actually really fun. It was useful, helpful, and informative. Even if I don’t get offered an interview, it was a good use of my time, personally and professionally. Even if I don’t get the job, I know more about Alumni Relations and what the “work” is. This information will only help me. I am in love with this post by Stacy Janicki. It says, for me, so many things that I am trying to practice in my own life and work. It says so well the career counseling and leadership advice I am trying to share with my students. She talks about the tiara syndrome and how to combat it. She encourages women to learn self-promotion skills and to ask for what they want. Have you had a tiara-resistance moment?